In these poems there is a deep connection to all five senses and how they figure into daily life; what we eat, see, touch, hear, and smell while going about our daily tasks are overlooked by most and captured as significant pleasures by Gwen, who lives with her body open to the sensual. These are humble poems, in that the writer is humbled by the stars sparkling overhead or by the little things her son learns which inspire awe. Happily she is able to close her hand around a pen, even at 3:15 am, and share it with her readers. This voice is completely unguarded, unprotected, yet strong. Grounded. This voice loves life. Some people, especially when faced with difficult circumstances, long to run away, to start over, or even to be someone else, whereas these poems are all about staying, putting down roots, and growing. They are present. They are about being here, now. These tender, honest poems embrace life in all of its simple, unpretentious beauty – its elemental beauty – earth, sea, moon, stars, mother, son. Even when there is loss and grieving, what I notice most is how much life there is, all that is blooming and thriving. The abundance of her life. What I notice is joy. Here’s the complete poem from August 13, 2010. Here’s Danika Dinsmore’s review on her blog The Accidental Novelist. 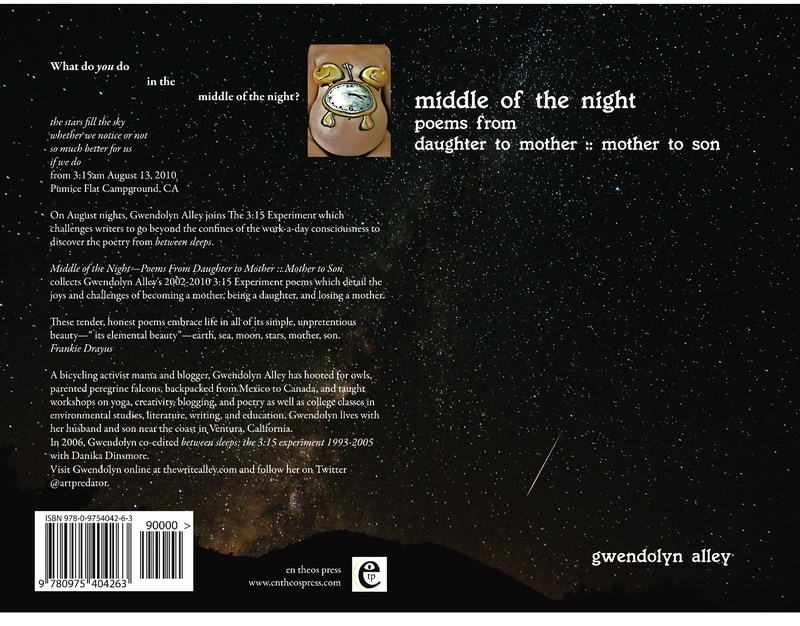 Middle of the Night Poems From Daughter to Mother :: Mother to Son collects poems about being a daughter, becoming a mother, and losing a mother from the perspective of 3:15am as written during August nights from 2002-2010 during the annual 3:15 Experiment. Middle of the Night Poems From Daughter to Mother :: Mother to Son had its impetus from two recent events: my mom’s death the day before the 2010 3:15 Experiment commenced and my selection for a makeover and to speak at this year’s Women’s Conference at the Long Beach Convention Center Monday night October 25, 2010. en theos press (Seattle) also published between sleeps: poems from the 3:15 experiment 1993-2005 which Danika Dinsmore and I co-edited. Cover photograph by Alan Sailer. Signed numbered limited edition chapbooks produced for the Women’s Conference available NOW. Order yours for $12 from en theos press today! Paperback bound copies available 1/11/11–order now for free shipping in 2011! ← Watch the Solstice Lunar Eclipse Online NOW as it happens! Omedetoo! Congratulations. No more fitting, beautful memorial to yr Ma & the inspirational relationship between you. Biggahugga, Happy Happy.